Some of our family will have a vacation in Orlando this week. We can't go along with their schedules because I am still working and my company did not allow me due to Holiday block out. So, my husband and I reserved our stay in Orlando in a later date. 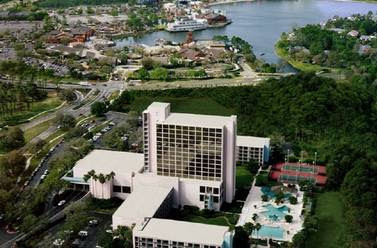 Man was I glad that continental.com offered me a good deal in this hotel in the Walt Disney World Resort. I am so excited this time even if I live in Orlando before because we will be staying in one of Disney property. Regal Sun Resort is formerly known as the Grosvenor is a multi-million-dollar renovation that created a NEW rejuvenated resort. The lobby was upgraded echoing a Bermuda atmosphere as guest describes it. This is the place where we will stay for our next vacation. I would surely splash on this elegant and soothing focal point of the resort. 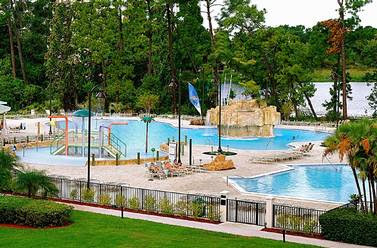 As you can see on the picture below, the huge poolside is a clover leaf-shaped. There is a water cannons that spray in it. The landscaping is truly awesome! It has a large hot tub on a raised platform, overlooking both the pool and the picturesque lake.